Last month, we sloshed through the flood waters along the Delmarva Peninsula, and I shared a bit about Pony Penning Day still taking place even with the fairgrounds seeing water levels several nearly a foot deep! If you missed that post, you can read it here: http://www.hhhistory.com/2016/11/rains-are-still-pouring-down.html. This month, it's December, and I'm in a Christmas mood, so it's time for some island traditions. 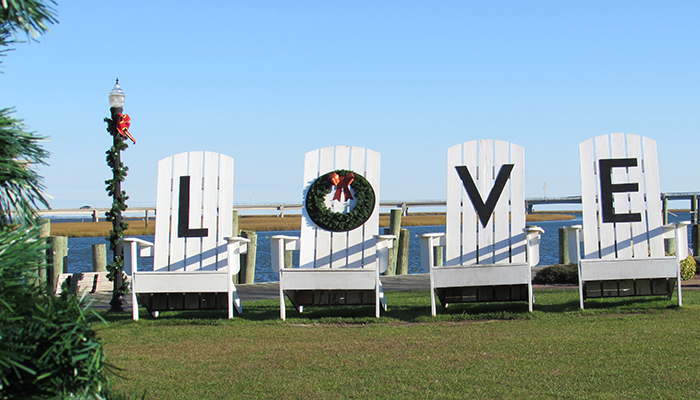 Voted the #1 beach town in America, Chincoteague Island might not seem like the place to go when the cold weather hits and temperatures start turning to freezing. But getting in the water isn't the only appeal about the beach. My family recently visited the island when gathering with family for Thanksgiving, and I decided it would be a great time to take my children there to showcase some of their family heritage. 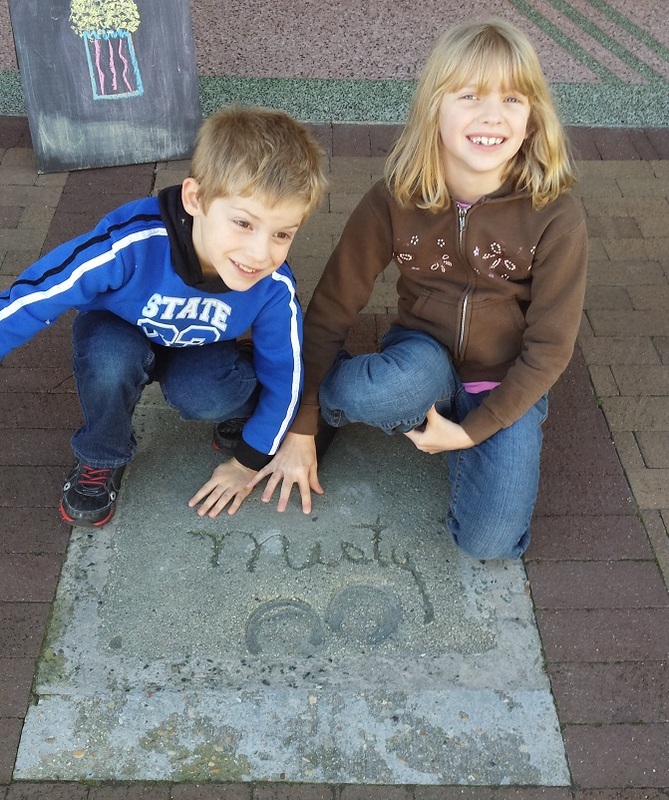 Here is a photo of the two of them posing in front of the movie theater with Misty of Chincoteague's footprints in cement. Second only to the annual Pony Penning Day festivities at the end of July each summer, the holiday season has been next best time of year to visit Chincoteague Island for generations. The average air temperature in December is about 50 degrees with sunny skies. Just imagine yourself, in a cozy warm sweater, listening to the laughing gulls while walking along the beach to the rhythm of the ocean waves, gathering shells and driftwood for holiday ornaments. That's what residents of the island have been doing for over a century, and even today, they invite visitors to join them in the casual and traditional fun. You can experience a beautiful sunset at the dock just like thousands of others before you, and when it disappears on the horizon, you can savor a bowl of clam chowder with warm bread, or feast on roast turkey and oyster stuffing. 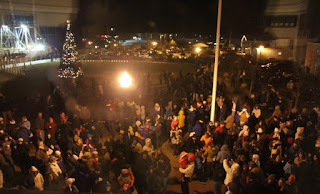 The day after Thanksgiving became the start of this holiday season back in 1925 with what is now the annual lighting of the town Christmas tree. Not long after, the island theater began showing It's a Wonderful Life, and that tradition continues today. Residents and visitors alike gather in the historic theater every year to enjoy this classic film on the big screen. Have you ever watched this film? What Christmas festivities are complete without a good old-fashioned parade? 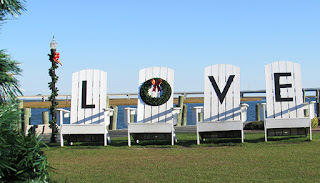 Chincoteague Island does it up in style! Complete with marching bands, floats, color guard, fire department companies from around the area, Saltwater Cowboys, and of course Santa Claus with his "reindeer" ponies leading his sleigh. :) For many years, this parade also paid homage to the sea by featuring King Neptune and his Mermaid Queen. 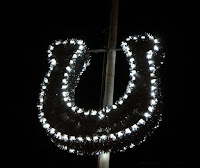 More recently, this tribute was left out of the parade, but it is seeing a return this year...back by popular demand. Another big event is the annual Holiday Treats Sale, where everyone is invited to sample treats and goodies baked by island residents and sold, with the profits benefiting a charity of choice each year. The second is the Children's Tea Party with Mrs. Claus, where Mrs. Claus and a select group of her favorite elves show the children a scrapbook of her life with Santa. 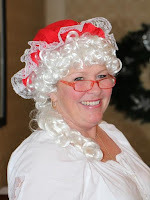 She offers a sing-a-long of Christmas songs, games, and gifts. After the children have had their hot cocoa, kid-sized sandwiches, and Christmas cookies, they have an opportunity to have their photo taken with the Queen of the North Pole. From black-and-white treasures to the more modern digital captures, this tradition has long been enjoyed by children for decades. Christmas Eve is celebrated with a breakfast offered to anyone on the island and a traditional candlelight service in the evening. Christmas morning is shared with families and friends in the many homes on the island, but you might also find some taking a peaceful stroll along the beach and enjoying a silent night. 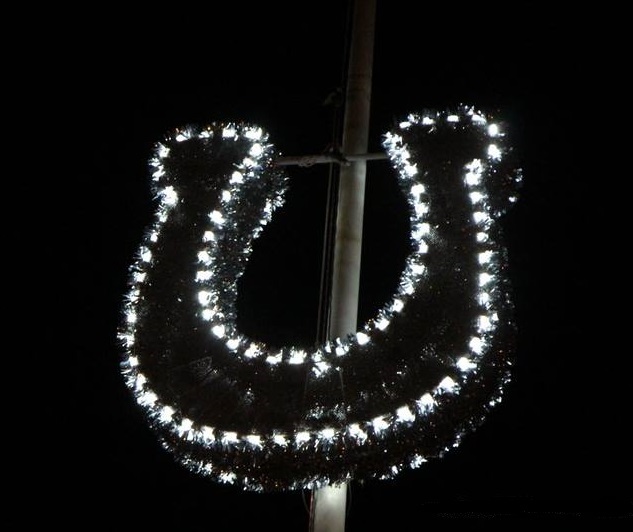 The island rounds out the holidays with the annual Pony Island Horseshoe Drop. It's not made of Swarovski Crystals, but it's lighted and it sure does sparkle! And what's more invigorating than starting your new year with a plunge in the frigid waters of the Atlantic Ocean? That's right. It's called the Polar Pony Plunge, and in recent years, it's been commemorated with t-shirts and other souvenirs to brag about your feat! So, if you want to be part of the festivities and traditions, bring your camera to capture everything, dress warm, wear a hat and gloves for sure, and comfortable shoes so you can shimmy and dance to the musical beats, but most importantly; bring family and friends with you to enjoy the grand fun that is all Chincoteague! * What are some traditions in your own home that have survived generations in your family? What is a new tradition developed by you with the current generation? 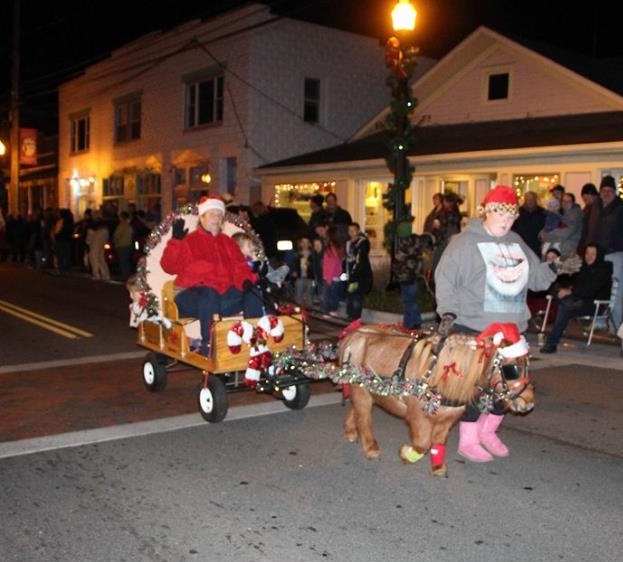 * Have you ever experienced a small-town Christmas? If so, where? What were some of the unique things that took place? * What is your favorite part of the Christmas season? Leave answers to these questions or any comments on the post below. Next month, it's a new year, and I haven't yet determined my new theme for the year. Come back on the 9th of January to find out more. Tiffany Amber Stockton has been crafting and embellishing stories since childhood, when she was accused of having a very active imagination and cited with talking entirely too much. Today, she has honed those childhood skills to become an author and speaker who has partnered with Nerium International in the anti-aging, wellness, and personal development industry, helping others become their best from the inside out. She lives with her husband and fellow author, Stuart Vaughn Stockton, in Colorado. They have one girl and one boy, and a Retriever mix named Roxie. 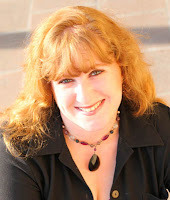 She has sold twenty (21) books so far and is represented by Tamela Hancock Murray of the Steve Laube Agency. You can also find her on Facebook, Twitter, Pinterest, and LinkedIn. 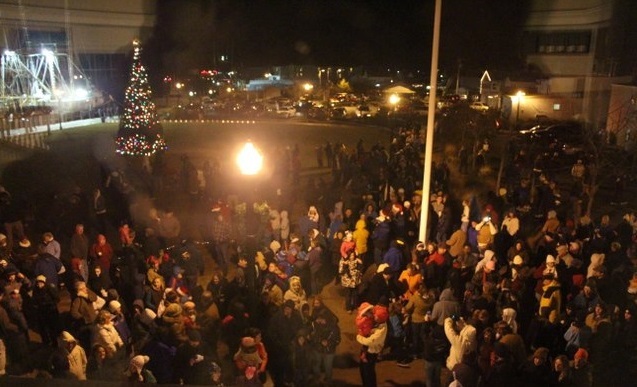 I've never experienced a small-town Christmas. We put our tree up the weekend after Thanksgiving Day. Since our kids had allergies, we've had a fake tree for decades. I hang the stockings I made when our boys are young on the mantel and decorate the living room. I have a lot of small fabric snowmen and Christmasy bears that my granddaughter places all over the living room each year. On Christmas, we usually have a ham dinner after we've opened presents. It's all more fun now that we have a kid in the mix again. Growing up in a rural area the neighborhood had monthly community members in the old one room school house. At Christmas time a tree would be decorated during the meeting and before the evening was over Santa would come bringing a gift for the children and treat bags with candy, peanuts, apple and an orange. 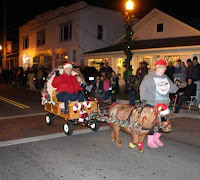 The town I live in town has Christmas on the square with different activities--chestnuts roasting on an open fire by a group, open sleigh rides, Santa's house, etc. Thank you for sharing.